Orchard Hill Residents - lock up your hearts! Pansy Parker and Misty Green are rivals in romance. Each believes she is the town's best matchmaker. Now, they're going to settle the question for once and for all. They're keeping track to see who can make the most matches in a year's time. No heart is safe in Orchard Hill - not even their own. Artist Angel Marcell is on her own for the first time in her life. If only her brother would stop treating her like a child! 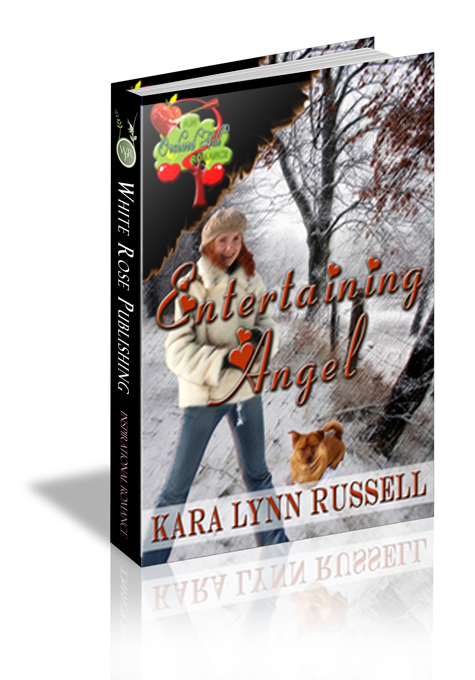 He's asked one of his college friends to watch over her while she's in Orchard Hill visiting cousin, Misty Green. Jeff Bradley is working day and night to make his real estate business a success. He doesn't have time to entertain his friend's little sister - no matter how cute she is when she blushes. Besides when she's around, his life turns into chaos and he starts longing for things that aren't compatible with his business plan. When Angel stands in for a Valentine's Day date, will he change his mind about what he wants? “Just the usual.” He walked up to the counter and set down a stack of envelopes. Once the postal carrier left, Misty allowed her smile to disintegrate into a scowl. Her rival in matchmaking, Pansy Parker, had recently claimed the first match of the year, Grace Randall and Riley O’Neil. Now, Misty found herself O-and-one in the contest she and Pansy were having to see who could make the most matches in a year. Well, what kind of challenge was that, anyway. Grace and Riley had been friends since kindergarten. Anyone could see they were perfect for each other. Once her fiancé, Steve was out of the picture, the two were bound to get together. Now, Misty was the type of person who enjoyed a challenge. And that was just what she had in mind when she invited her cousin’s daughter, Angel, to visit. Once Misty had found out that Angel’s brother, Tony, had been the college roommate of Jeff, the new real estate agent in town, Misty had started thinking. And what she had come up with, was that Angel and Jeff would be perfect together. “Let’s see if you can top that, Mrs. Pansy Parker,” mumbled Misty to herself as she sorted the mail that Fred had handed her. There was a letter from her father. He had moved to Florida years ago after he’d retired from his teaching job. Misty looked forward to his long letters. She opened it and began to read. By the time she reached the end of the letter, her scowl had returned. “He’s coming for a visit. Why now?” She re-read part of the letter, and noted with relief that he wouldn’t be here until next month. That would give her plenty of time to wrap things up with Angel and Jeff. Although Misty truly loved and admired her father, she preferred a long distance relationship with him. She was sure he’d frown on her hobby of making matches and try to discourage it. He had a tendency to meddle in her life, and if it was one thing she hated, it was a person who interfered in other people’s lives. Misty shrugged. Her father never stayed long. She’d have plenty of time to visit with him and still beat the pants off Pansy Parker at matchmaking. Jeff Bradley swiveled in his office chair so he could gaze out of his window at Blossom Street. Across the street, Riley O’Neil was going into the Grace Place where Grace Randall was waiting for him with a steamy mug of coffee and an equally steamy kiss. Jeff sighed and turned away from the window. “I see,” said Jeff, mostly to assure Tony he was still listening. Which he was, sort of. “So Angel’s life has been a little…sheltered. She’s awfully naïve for a woman of her age. And now that Mom’s passed away she has this idea about starting her own business. Dad’s cousin, Misty, convinced her that there was a market for her stuff in Orchard Hill. “And I don’t?” Jeff drummed his fingers on his desk impatiently. Jeff did not want to deal with this right now. His plate was too full as it was, with starting his own real estate office. He needed to work hard to establish himself, and all the while his very successful parents were looking over his shoulder. But Tony was a good friend, and Jeff didn’t want to let him down. Jeff relaxed. This wasn’t going to be so bad. Jeff stifled a groan. He should have known he wasn’t going to get off that easy.